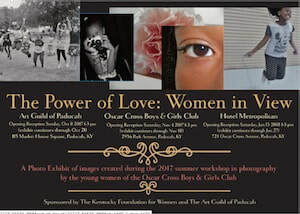 The Art Guild of Paducah received a grant from The Kentucky Foundation for Women to conduct a photographay workshop at the Oscar Cross Boys and Girls Club of Paducah. The workshop was conducted during the summer of 2017 by AGP member Elizabeth Ray and about 15 young women participated. The photos from that workshop were professionally framed and exhibited at five different venues around Paducah. AGP Members David Lucht, Ellen Kramer and Marie Mellot have formed a committee to create the first Plein Air painting competition to ever be held in Paducah, Kentucky. The event will occur May 30 - June 1 2019 and will be called "Art of the Town - Paducah Plein Air". Stay tuned for details!